It is getting to be that time of year again. Fall is now upon us, and it is time to start thinking of getting your landscaping–and especially your roses and rose bushes ready for winter. Depending on the type of roses and rose bushes you have, there are several things that you can do right now to help them survive the winter. 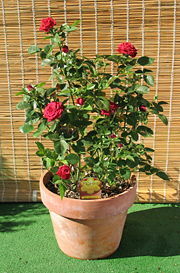 If you have tea roses, it’s important to gather all of the soil and mulch up and over the base of the rose plant or rose bush–about 8 inches. Doing this will protect the graft union of the rose bush from the severe cold if you have any in your region. Hybrid tea roses should be pruned down to about 12 to 18 inches in height, and then covered up to protect them from the wind and the sun. You should avoid using plastic rose cones that do not have ventilation holes. Shrub roses generally need very little winter protection–most shrub rose bushes do not have a graft union that you need to protect. But, it will help to put at least 3 or 4 inches of new mulch over the top of the rose bed. Protecting the bush from any strong winds will also help. You can also fertilize them at least a few weeks before the soil freezes. For climbing roses, you will need to lay the canes down for winter protection. Do this after the leaves are completely off the plant and the plants have “hardened off”. 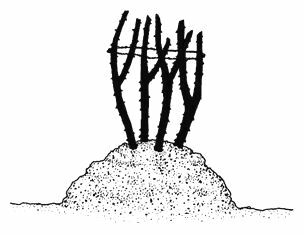 In the spring, when the danger of any severe cold has passed, pull the mulch off of the canes of the plant and stand them back up again. — protect the rose roots, graft unions, and branches from direct injury by ultra cold temperatures. — protect the plants from the drying effects of winter winds. — protect roots from freeze and thaw cycles, the fluctuating temperatures that can cause heaving, root disturbance, and drying out of roots. — protect the stems from damage caused by warming in bright winter sunshine and then rapid freezing at night. — protect the plants from creatures that enjoy feasting on rose branches during winter. Choosing your planting site/location can help protect your roses and rose bushes during the winter. Choose a sunny, well-drained spot. A favorable planting location is a place where the roses are sheltered from the northern and western winds — protected by a house or other structure, or by a row or hedge of evergreens. 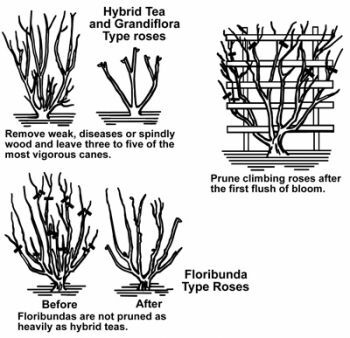 Hybrid roses should be planted with the graft union 1 to 1 and a half inches below the surface in cold climates. If you’re in a northern zone of the United States, choose the hardiest variety of rose available. In fact, if you’re located in any area (even the southern States), it’s generally a good idea to choose the hardiest variety available. Most hybrid roses have not been tested for winter hardiness, so most of the time you just have to experiment for yourself–or check with your local gardener or nursery. Here’s a list of rose varieties that seem to be the hardiest for the northern States: Deesse, El Capitan, Golden Jubilee, Golden Slippers, Golden Wings, Heirloom, Iceberg, Ice White, Irish Gold, Lemon Spice, Lily Pons, Lucky Lady, Manuel Pinto de’ Azeredo, Marie Antoinette, Medallion, Mount Shasta, Nearly Wild, Poulsen’s Bedder, San Antonio, Show Girl, Simon Bolivar, Soeur Therese, Tamango, Tip Toes, Vogue, White Prince. Preparing your roses for the winter should have begun this past spring and summer. If you kept your roses healthy by watering, weeding, fertilizing, pruning, controlling diseases, and fighting off insects, your roses and rose bushes should be in very good shape to face the winter months. Healthy roses and healthy rose bushes should survive the winter months better than those plants that are weak. By mid-August, you should have started preparing your roses by stopping all fertilization. If you haven’t done that yet, then stop fertilizing immediately. Giving your roses extra fertilizer at this time of year will just encourage new succulent growth, which is not a good thing. Tender young branches will not be ready to face the cold, winter months, and will most like die during the winter. The best thing to do is to make sure that your roses and rose bushes “toughen up” a bit. In late fall, perhaps in a few months, after the leaves have died, pick off any remaining leaves on the stems and pick up any dead leaves from the ground. Keep in mind that some fungus spores and other pests can “overwinter” on dead leaves. Do your best to reduce your pest problems next spring by using good sanitation practices during the fall. Make sure that you do not prune the roses or rose bushes in the late summer. Pruning encourages new growth, which is not a good thing. After August, stop deadheading. Irrigate adequately in the fall (at least 1 inch per week). Make sure that you give your plants a good watering just before the ground freezes; roses can suffer as much from dehydration as from cold during the winter. Many rose growers suggest that you add moth balls or mouse control bait (poison) to their mulch to discourage rodents. Do not mulch too early in the fall months. Doing so may interrupt or delay the natural development of hardiness. Do not prune winter dieback too early in the Spring. Wait until the new growth is a few inches long. What may have looked dead at first, may be alive! Winter protection ranges from nothing at all to very elaborate measures. Rugosas and other known cold hardy roses generally do not need any protection at all. Some growers will build a protective structure around these roses of burlap or chicken wire and fill it with mulching material. Some more protection can be given your roses just by piling extra snow onto them; snow is a great insulator. Mounding your rose bush is another method that works well for many people who grow roses successfully. After the first hard frost, shorten the canes (but not to soil level) and tie them together to prevent the wind from whipping them around in winter and loosening the soil. Bring in soil and mound the base of each plant with 8-10 inches of soil. Avoid using clay or other heavy soil. 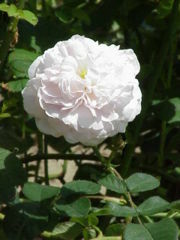 Do not scrape the soil from around the plants, since this may injure the surface roots of the rose. 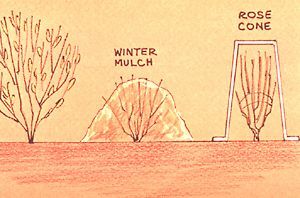 Increase winter protection by mulching with wood chips, sawdust, shredded hardwood, or pine bark, or with a mixture of soil, compost, and mulch instead of plain soil. Pile this mulch to a depth of 15-18 inches. After the ground is thoroughly frozen (usually sometime after Thanksgiving) and you no longer have to worry about mouse invaders, build a wire netting fence around the bed. Fill it 3 feet deep with leaves, hay, straw, or strawy manure. Cover with marsh hay or some soil to keep the leaves or other materials from blowing away. Do not cover with impermeable material such as plastic, tarpaper, or other waterproof covering. Around the middle of April, remove the marsh hay, leaves, and soil. Water thoroughly.